To choose an ESL program, it is important to define your goals. Ultimately, students need to know what to say when they go into a grocery store in an English speaking country. They need to be able to speak English. Knowing all about the past perfect tense and knowing 1500 English words is of no use if you can’t speak English in complete sentences. We always used oral questions with our lessons. 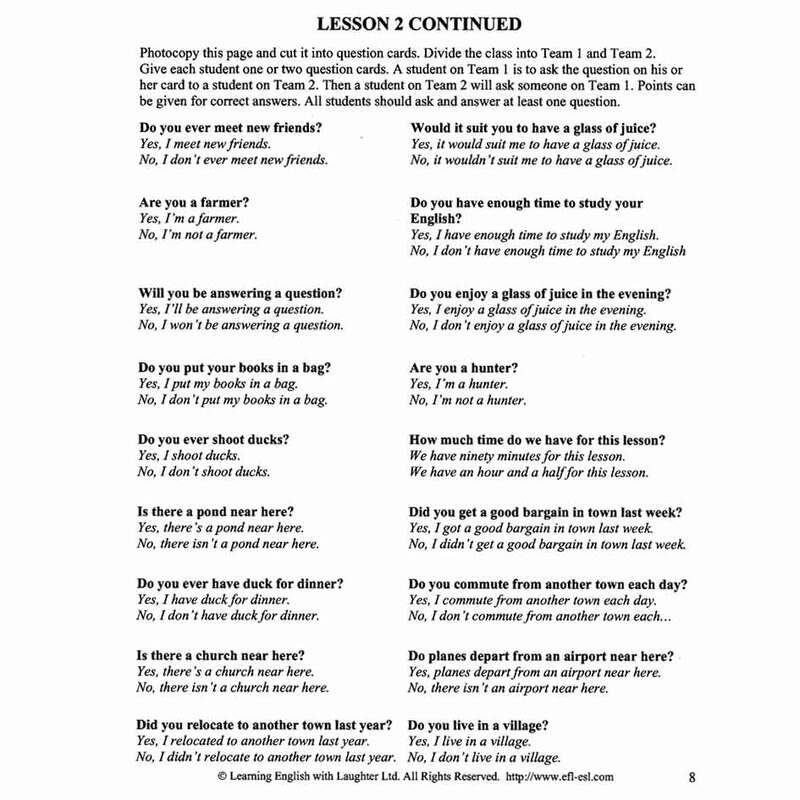 For each class we had a list of ten to twenty oral questions, so that each student was asked at least one oral question. We insisted that the answer take the form of a complete sentence, rejecting “yes” and “no” answers. In this way, the students were given individual practice in forming a correct sentence. The other students got practice in listening comprehension as they listened. Using the oral questions given with the lesson is very helpful, but you can retain the grammar, and still ask different, more topical questions, so that the students can have a bit of fun. We found that even though oral questions are hard work for the students and teachers, they were very popular with our students. Students like to feel confident with what they are doing before encountering a lot of new material. 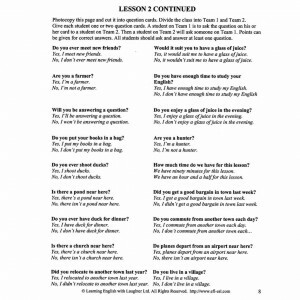 A ESL curriculum that has tests after every four or five lessons allows the students to feel confident to move on if they did well on the test. At first students are fearful. (They have often been conditioned for years to think that they are slow.) If they have a test after just four lessons, and they achieve a mark in the 90 to 100 percentile range, they begin to feel some real confidence. Click to enlarge. This page may be printed. Every curriculum should involve small group activities. There are many ESL activities where small groups of three or four students work together to make a report, and then report back to the whole group. Students enjoy the relaxed atmosphere that this creates, and they are able to help each other. One activity we used a lot involved the students asking each other oral questions. Divide the class into two teams. Give each student a paper with one or two oral questions on it, with the correct answers. Have the students ask a student on the other team the question. If the answer is correct, that team gets a point. The teacher acts as scorekeeper and referee. In the end, a curriculum that is based on a conversational approach, where the students can relax while learning, is the best choice. The curriculum should be based on practicability. The faster you can teach English that they could use in their everyday activities the better.